Detroit Michigan, once the industrial capitol of the world, the birthplace of the assembly line and home of the first push into the industrial age. A place where wealth was created and mass production born. Now......A City looking to redefine itself, to pull itself out of this dizzying state of decline that has been taking place ever since the economy became one of global trade and production. But as this slow transformation takes place, the remnants of Detroit's once glorious past fall into ruin. Beautiful churches adorned with ornate stonework to equal the monolithic houses of worship found in Europe now crumble before our eyes. Industrial facilities that cover enough land that they could be their own small cities, once producers of that most iconic of American products, the automobile, now wastelands of brick,steel, and weeds. Palatial residences, multistory luxury apartments, created with opulence in mind, now abandoned and stripped of their recyclable materials to feed a society that is clamoring for a way to survive. The following images were captured in Detroit while on an "expedition" there with a small group of adventurous photographers. This was both an exciting trip, and a humbling and sad experience as well. But I do retain hope and confidence that some day, Detroit will rebuild herself. Maybe not to the position she once held, but into a new and equally inspiring city in her own right. The supporting columns at St. Agnes are crumbling to the point where the building will collapse upon itself leaving only memories of its once great presence. Despite the amount "sadness" found in these locations, there are still little things that put a smile on my face. There will be no class today........ 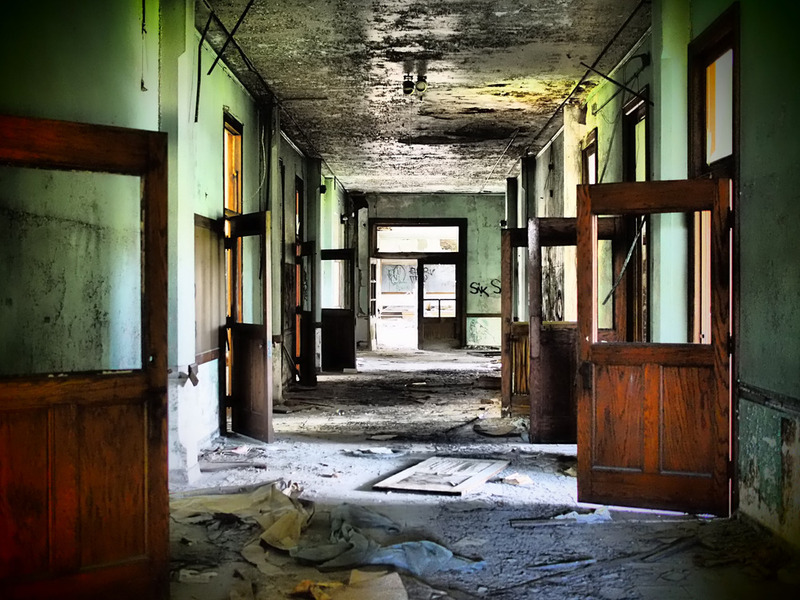 The school at St. Agnes is a haunting place to walk through, even during the day. Every classroom in the school was a scene of dismay. It was confusing to try and understand how some things looked like they had never been moved, and others were obviously places of recent activity. This is how the abandoned are reclaimed. Mother nature plants a foothold inside the hallways with this small slice of life. Slowly the weather and plants will break down the building reclaiming it. The Lee Plaza Hotel. High Society No More. The next location is the Lee Plaza Hotel and Apartments. Constructed in 1929 and built in the Art Deco style that was the a sign of class in the 1920's this is 15 floors of sadness. The ground floor of the Lee Plaza Hotel contains this once elegant ballroom which played host to countless social gatherings and endless nights of entertainment. It now plays host to urban explorers and artists armed with spray cans. Welcome to the 8th floor of the Lee Plaza Hotel. Anything salvageable has been taken away. Copper plumbing and wire, plaster details from the ceilings, brass door hinges.....All removed. A room with a view? Done. Not a single window remains. It all looks fine from up here. The 16th floor of a 15 floor building. The rooftop is easily accessible and offers incredible views. Reaching the open air portion of the rooftop the spring breeze and warm sunshine sort of washed away all the anxiety of being in such a desolate place. Off in the distance you can see the smoke from a large structure fire. This is the narrow end of the Fisher Body plant. What you can't see is how LONG this building is. Six stories and MILLIONS of square feet. Each floor has its own "feel". Although structurally similar, there were definitely things to set them apart. Blues......Or as one of my companions calls this,"the blue floor".....For good reason. Decades of paint peeling with a thickness comparable to potato chips. This place personifies texture. And like EVERYPLACE we visited that day......There was an abundance of art. I call it art because that is what it is. I won't argue semantics. And like the other locations......Rooftop access offered some of the most incredible opportunities to photograph. I have so much more to say, and even more photos to share. I will save those for a time when it isn't all so fresh in my mind. I want to digest this experience and see how I feel about it after it has all sunk in.